In a recent Boing Boing post, I learned about Ub Iwerks, who worked for Disney in the very early days, and designed Mickey Mouse, before he left in 1930 to form his own studio. Here is his 1934 version of Aladdin and the Wonderful Lamp. Despite its name, illustration from comic books is only one small part of the art featured on Golden Age Comic Book Stories. This blog showcases graphic art and design of all types, often focusing on one particular artist. Works are drawn from book cover and interior illustrations of many genres including fairy tales, science fiction, history, fantasy, etc. 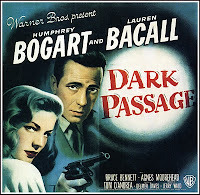 ; as well as comic strips, editorial cartoons, fine art, prints, and in this recent post, Film Noir Posters from 1941 to 1958. Old Radio + New Tech = Portable Lindy! Here is another recent post about swing dance, this time from the Make: blog. It seems a tech savy hep cat hacked a 1946 portable radio to accept an iPod, creating a portable, period accurate swing dance machine. The weekly Red Hot Lindy Hop lessons and sessions continue at the Rumba Room. Free dance lesson at 7:00 p.m. with Jaredan and Michelle followed by music with DJ Jaredan until 9:30 p.m. Salsa at 9:30 p.m. I once heard a folk song, apparently written by the late John Hartford, about a steam powered airplane. Little did I know that someone actualy built such a craft. The Make: blog recently posted this item about a working steam powered airplane from 1933. In the same vein as Friday's post about Western Swing, I recently discovered this blast from the past on Pappy's Golden Age Comics Blogzine. From 1947, here is Suzie, a city-slicker chick who signs up to work on a dude ranch. Stephen Worth, Director of the ASIFA-Hollywood Animation Archive, was a recent guestblogger on Boing Boing. As a result, there were several posts about animators from the golden age of cartoons. One featured artist was Carlo Vinci, whose work included the Mighty Mouse short below: Gypsy Life. Western Swing on 78, a site with downloadable collections of MP3s from out of print 78 RPM records donated by a small group of collectors. One of the many genres that emerged as the original swing began to dissipate into other forms of music, Western Swing is a great, if mainly unkown, source of fun. Boing Boing also has some performance video here. As if to get you in the mood for the Red Hot Lindy Hop session this Friday, Boing Boing recently posted this 1944 educational and instructional Pete Smith Specialty about the Jitterbug: Groovie Movie. Lindy Hop and Cuban Cuisine! The weekly Red Hot Lindy Hop lessons and sessions continue at the Rumba Room, which has a new menu complete with authentic Cuban cuisine! 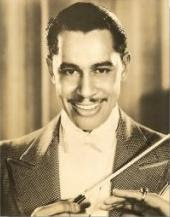 Free dance lesson at 7:00 p.m. with Amanda and Kirk followed by music with DJ Amanda until 9:30 p.m. Salsa at 9:30 p.m.
For the Martin Luther King, Jr. holiday yesterday, Film Noir Photos posted a set of pictures featuring pioneering African-Americans in the entertainment industry; including Josephine Baker, Cab Calloway, and Hattie McDaniel (left). 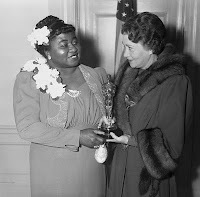 In addition to being the first African-American to win an Oscar, she was the first African-American woman to sing on radio in America. She was sometimes criticised for often playing a maid (e.g. her Oscar-winning role as Mammy in Gone With The Wind). Her response was "I'd rather play a maid and make $7000 a week than be one for $7." 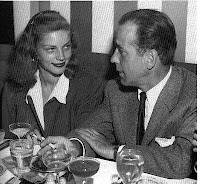 Film Noir Photos recently posted a nice set of pics featuring Humphrey Bogart out with several notables, including (of course) Lauren Bacall (at left in 1947), as well as his first wife, actress Mayo Methot, and Audrey Hepburn. It seemed like a good time to bring back the Man of Steel. From the Internet Archive, the 1942 Superman animated short: The Magnetic Telescope. A hummer (n.) -- exceptionally good. Ex., "Man, that boy is a hummer." Not to be confused with a large SUV based on the platform of a military transport vehicle. Since the Detroit Auto Show is this week, this post seemed appropriate. 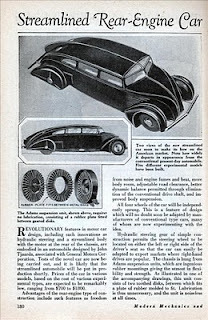 This 1931 issue of Modern Mechanics (from the Modern Mechanix site) features a streamlined rear-engined car designed specifically for the American market. It reminds me of a cross between a Chrysler Airflow, a Volkswagen Beetle and a mid-1930's Czechoslovakian-made Tatra. Tatras actually had a vertical fin splitting the two rear windows. The weekly Red Hot Lindy Hop lessons and sessions continue at the Rumba Room! 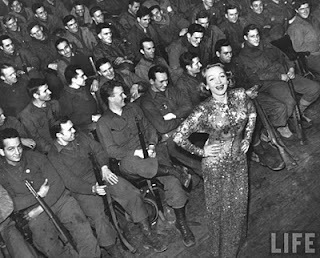 Free dance lesson at 7:00 p.m. with Erin and Mike followed by music with DJ ALexis until 9:30 p.m. Salsa at 9:30 p.m.
Marlene Dietrich to U.S. troops in February 1945. Anyone who has ever been inside a courthouse has probably had a similar train of thought to that of Ms. Boop in today's short. From the Internet Archive, featuring Betty Boop singing "Sing, It's Good For You," here is Judge for a Day. I saw this video some time ago, but it is apparently making the web rounds again, and with good reason. From 1944, the Ross Sisters singing, dancing and contoring "Solid Potato Salad." Keep warm this Friday night with the weekly Red Hot Lindy Hop lesson and session at the Rumba Room! Free dance lesson at 7:00 p.m. with Michelle and Jaredan followed by music with DJ Jaredan until 9:30 p.m. Salsa at 9:30 p.m. I stumbled across a series of interesting sites recently, one being Pappy's Golden Age Comics Blogzine. In case the name leaves any doubt, "Pappy" has scanned tons of classic comic books for all to enjoy. 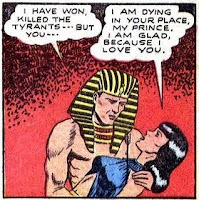 In one recent post, Pappy featured Ibis the Invincible, a 1943 comic about an ancient Egyptian prince/sorcerer who put himself to sleep for 4000 years to be reunited with his love, who was struck by a magic arrow that put her to sleep for 4000 years. Here is another neat post from The Boat Lullabies. During World War II, some recreation centers for military personnel offered the opportunity for them to record a message or song on a phonograph disc and send it to a loved one. 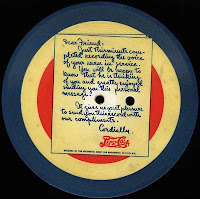 This post features photos of both sides of such a disc, sponsored by Pepsi-Cola, as well as an audio clip of the recording. The would be crooner on this record is somewhat worse for drink, and the recording quality has deteriorated over time, but the glimpse into history, both visually and aurally, is interesting. Let me be the first to join (from left) Nora, Nick and Dorothy in a toast wishing you all the best for 2010! 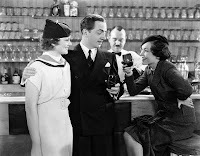 Thanks to Film Noir Photos for a great posted collection of movie stills and posters, including this shot from The Thin Man (1934) starring Myrna Loy, William Powell and Maureen O'Sullivan.